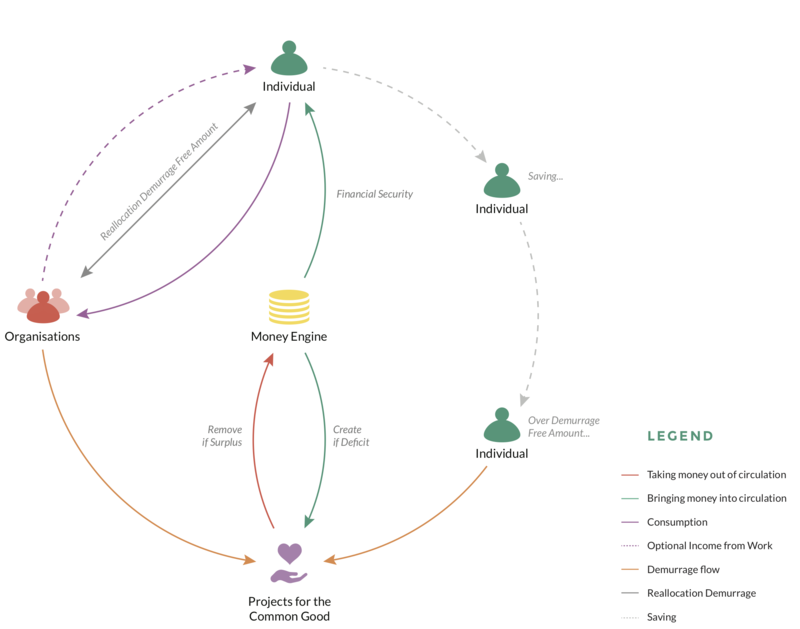 This paper proposes a theoretical monetary model, named Sustainable Money Systems or SuMSy, which has the assumed capacity to change the shape of the economic ecosystem in such a way that it puts the wellbeing of people and the planet at its core. In order to achieve that, we have leveraged new ways for bringing money into – and for taking money out of – circulation and have implemented mechanisms that drive sustainable behaviour. At the heart of SuMSy is a money engine which generates money to be brought into circulation and which can be taken out again too. Money is brought into circulation for specific goals, i.e., to provide a guaranteed income for everyone and to fund projects for the common good. With SuMSy everyone receives a guaranteed income. The money needed for paying this guaranteed income is brought into circulation when necessary. The guaranteed income should be high enough to be able to lead a decent life. We acknowledge that the exact amount of this guaranteed income cannot be set in stone and must be changeable in the future to adapt to real living costs. The decision for this must be made in such a way that it is assured that everyone can lead a decent life within the constraints of available resources of the planet. A couple of options to achieve this are presented below. The money to finance education, healthcare, public transport, etc., is partly paid for by demurrage fees and taxes and partly brought into circulation as needed. These monetary streams must be completely transparent in order to avoid corruption. We propose that the decision through which projects get the label ‘project for the common good’, and the accompanying ability to bring extra money into circulation, should be decided by the general population, thereby giving them governance powers and increasing their stake in society. Since constantly adding money to the economy leads to out-of-hand inflation, there also needs to be a mechanism that takes money out of circulation. When a balance is reached between bringing money into circulation and taking money out of circulation the total mass of money stabilises, thereby creating a stable pricing scheme as long as the velocity of money remains stable too. A demurrage fee is a fee that is payed for holding on to capital. This is a percentage of the money held in accounts and is collected just before guaranteed income is added to someone’s account. This money is immediately redirected to projects for the common good. The person paying the demurrage fee has the choice to assign it to one or more of his/her preferred projects. Surplus money from overfunded projects is taken out of circulation. Projects that are underfunded can bring money into circulation up the required budget. In order to give the capability to people to save some money as well, rather than creating a spending spree, everyone is given a demurrage free amount. As long as someone holds less than the demurrage free amount in their account, no demurrage fee is collected. The demurrage free amount can be spread over multiple accounts and even be lent to someone else. The ownership of the demurrage free amount remains with the person who lent it out to a third party and, accordingly, can be taken back at any time. Taxes are collected from activities that work against the wellbeing of both people and the planet. Examples of these are pollution, producing goods which aren’t recyclable, destruction of natural resources, and so on. The money collected from these taxes is redirected to projects for the common good, just like the demurrage fee. The person, people or organisation paying the taxes here can also redirect that money to his/her preferred projects. b. create a shift in power balance. The latter (b) is achieved because the power of decision to bring money into circulation is distributed throughout our model. Because history has shown that those who hold the power to bring money into circulation also obtain a lot of power on a political level, our model therefore shifts this power from the centralised model that exists today to a distributed model. It is our assumption that, by doing this, we would raise the sense of ownership and consequential accountability in the general population. Stef Kuypers has a history in IT, creative thinking, improvisation and business interventions. He self-studied economics, monetary systems, complexity theory and sociology by reading online research articles on the subjects and then engaging with progressive thinkers. He became interested in monetary systems after discovering that the biggest hurdle to solving our climate change problem is actually our monetary system. Because of this he started wondering whether we could create a monetary system which would create more sustainable economic and social behaviour and support the wellbeing of all people. That kind of thinking eventually led to the creation of the Sustainable Money System.